From Goodreads ~ You don't always know what you're getting into when you bring home a puppy. Enter Henry, a boxer who suffers from Supreme Dictator of the Universe Syndrome. He vandalizes his obedience school, leaps through windows, cheats death at every turn, and generally causes his long-suffering owner Erin Taylor Young to wonder what on earth she did that God would send this dog to derail her life. The author had a boxer when she was growing up and thought it would be a good idea to get another one now that she has her own family. She buys a puppy who has champions for parents and names him Henry. Henry turns out to be quite different from the dog of her childhood ... he's not affectionate, is high strung and doesn't obey commands. The family does all they can to train him ... obedience school, shock collars, etc. He sure is a rambunctious dog! I enjoy reading stories about animals and I liked this one. I liked the writing style and it was at times funny and kindly sarcastic. The author is a Christian so writes about God throughout the book ... I'm not religious at all so I skipped over those parts. I felt bad for both the family and Henry, though. Their lives are not their own because of Henry because he eats everything, he jumps through windows, he barks at people on the street, etc. 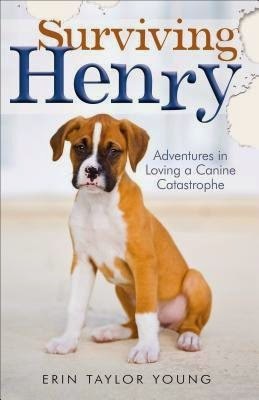 ... many times the author said she considered giving Henry away. I know the author was doing what she had to do but I didn't like reading about the use of the shock collars, etc.